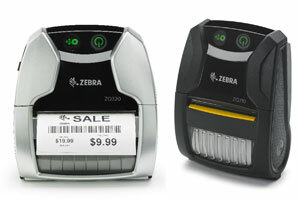 The Zebra ZQ310 and ZQ320 Mobile Printers are small, affordable mobile printers that can be used for both indoor and outdoor printing applications. Use the Indoor version in retail environments to print receipts and barcode labels. Get the outdoor version for your workers in the field to print high quality receipts in practically any environmental condition. 2" Mobile Printer, Linered Platen, 203 dpi, 4 Ips, Bluetooth BR/EDR LE4.0, Direct Thermal, 2280 mAh Battery. 2" Mobile Printer, Linerless Platen, 203 dpi, 4 Ips, Bluetooth BR/EDR LE4.0, Direct Thermal, 2280 mAh Battery. 2" Mobile Printer, Linered Platen, 203 dpi, 4 Ips, 802.11AC, Bluetooth BR/EDR LE4.0, Direct Thermal, 2280 mAh Battery. 3" Mobile Printer, Linered Platen, 203 dpi, 4 Ips, Bluetooth BR/EDR LE4.0, Direct Thermal, 2280 mAh Battery. 3" Mobile Printer, Linered Platen, 203 dpi, 4 Ips, 802.11AC, Bluetooth BR/EDR LE4.0, Direct Thermal, 2280 mAh Battery.